I often get asked questions regarding children and social media. It is such a new way of communicating that societal rules really haven’t caught up yet. We have rating systems with video games and movies, but how do we know if Facebook, Twitter, Instagram, YouTube and Snapchat are appropriate for our children? We don’t. The only way we can help guide them through the world of social media is to be aware of what is going on in these communities and set up rules and guidelines that we, as parents, feel comfortable with in our own homes. Here are some commonly asked questions that I get regarding kids and social media. What age should I let my kid have a cell phone? This is a tough one. In California, people are giving their kids phones as young as 8 years old. Because most phones have internet access, I wouldn’t recommend this unless you want them looking things up. In my experience, a 12-year-old can begin to handle the responsibilities of taking care of / not losing a phone. What you can do to keep them from exploring the world-wide web is get them a phone and restrict data access with your provider. Many providers will work with you so that they can text or call you but there is no data access (all of which you can control from your phone). You can also only give them Wi-Fi access and no cellular service. 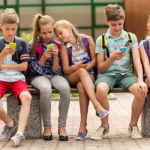 The issue with this is then, they have internet access… Before handing your child a phone, make sure you discuss all of these options with your cell phone service provider to make sure you get exactly the access that you want for your child. What are the ages to be allowed to create social media accounts? According to the Children’s Online Privacy Protection Act (COPPA), COPPA imposes certain requirements on operators of websites or online services directed to children under 13 years of age. Therefore, most sites do not allow children under the age of thirteen to have an account with them. Do kids under 13 lie online to create an account anyway? Yes. So, this is where you, as a parent, have some power. If you find out your 11-year-old has an Instagram account and won’t let you see it, you can report them to Instagram and get the account shut down. Can I see what my kid is posting online? It depends on the platform. In my house, the rule is that if I pay for the phone, I get to follow them on any and all social media. This includes my 20-year-old who is at college. They are still able to use snapchat, WhatsApp and Viber to text friends which won’t show up on your phone bill. I guess the good news with my method is that I see what they are putting out there to public, which is very important when it comes to future job prospects and college applications. Can I see who they are following or who is following them? Yes and No. On Facebook, Twitter and Instagram, yes. On Snapchat, no. The most popular and potentially secretive app is Snapchat, however, studies have shown that most teens are not using it to send inappropriate content or photos and actually kids feel less pressure to look and be perfect on Snapchat because the images disappear. There are pros and cons on all of these accounts, and again, my recommendation is to have accounts of your own and follow / friend your kids. What are some things I can do to keep my kid safe on social media? Make sure they have location services turned OFF, this is very important. You can do this in settings. Explain to them to not use their last name on their social media handles if they are under 16 years of age. After 16, they need to think of their social media accounts as something potential employers or colleges may be looking at (legal or not). My rule is to always post after you leave somewhere, especially a party or vacation spot. You don’t want someone unwelcome showing up since you’ve just announced where you are. Also, I suggest all kids under the age of 16 keep their accounts on private so they can approve friend and follow requests. You can’t get away from it and your kids are exposed to it. Social media is the way they communicate with each other and the world around them. They get news and entertainment from social media. The best way to keep your kids safe on social media is to stay informed and on top of it yourself. Trust me, you’ll be thankful you took the time. And remember, YOU are paying for that device in their hands, which means, you own it. Jennifer Hurless founded Go Be Social Media, LLC in 2010 with a passion for marketing and a flair for knowing how to connect to an audience. She has nearly a decade of social media experience specializing in brand relations, targeted marketing, reputation management and her creative content for optimal yet organic SEO results.